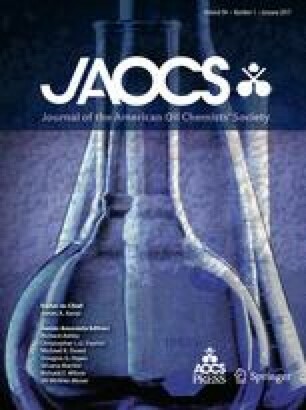 In this study, the oxygen radical absorbance capacity (ORAC) of vegetable oils was investigated using a spectrofluorometric method, which measures the protection of the phenolic substances of the oil on the β-phycoerythrin fluorescence decay in comparison with Trolox. More than 97% of the phenolic substances was extracted from the oil using methanol, and the methanolic extract was then used for the ORAC and the total phenolics assay. We found a significant correlation between ORAC values of different olive oils and the total amount of phenolics. For extra-virgin olive oils, maximal ORAC values reached 6.20±0.31 μmol Trolox equivalent/g, while refined and seed oils showed values in the 1–1.5 μmol Trolox equivalent/g range. Our method is useful to assess the quality of olive oils and to predict, in combination with the rancidity tests, their stability against oxidation.